Soak: Outdoor Gourmet grilling skewers for around 30 minutes. Preheat: Grill of frying pan to high heat. 400-450 degrees. Next: Mix garlic, ginger, curry powder, lime juice, Sambal Oelek Chili Sauce, and agave together. Brush over Bison strips Thread the beef onto the soaked skewers, working the skewers in and out of the meat so that the meat stays in place while grilling. 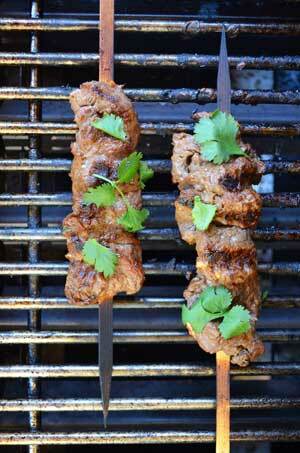 The flat design of the Cedar Skewers prevents rolling or spinning when you flip your food. Then: Place loaded skewer on hot grill or frying pan. Sear each side for 3-4 minutes. Remove, garnish with cilantro and enjoy! 16th Annual Buffalo Stampede is Underway! 2016 Buffalo Stampede is Another Great Success! A Brand New Durham Ranch Baby Bison!